Snake Eyes (two or more ones) — animals, lights in strange places, and things that bite. Ballerinas (two twos (or more)) — your fellow seekers, costumes, disguises, and things not as they appear. Little Woods (two or more threes) — trees, brambles and environmental obstacles. Bootlaces (two or more fives) — grit, remembering good things about your Beloved Dead, strength of purpose. Squares (two or more fours) — stone structures, roads, paths and written signs. Box Cars (two or more sixes) — sounds, vehicles, movement. This old, small isolated U.S. Midwest town was once a bustling center from the time in the 19th century when the railroad was being built to the end of the railway heyday after World War II. It’s located along a river between two stone bridges. The cemetery, located on a flat area above the river and below the rail line, is reputed haunted, although the younger generation speak of it only in jest; but it’s a sort of local holiday to visit the graveyard after Hallowe’en on All Souls’ Day to ask a boon of your ancestors. The time is twenty years in our future, circa 2040, and the local economy is in a slump. Danny (played by Aaron), a teenager, is here to talk to his father who had been a blue collar worker who lived his whole life in the town. Danny remembers walking here in the dark on that night of the year, with the reassuring presence of his father. Amy (played by Melissa), a woman in her early twenties, is a young scientist working on creating the next level of cyber personalities, imprints of entire personalities. She’s here not because of silly superstitions, but to look for the crypt where her grandmother is buried. Her grandmother was also a scientist, and her notes might be buried with her. Amy is autistic [modeled after someone in Melissa’s life]; she’s wearing earphones to isolate herself from other people. She’s thinking about her grandmother whose research was an inspiration. Morgan (played by Justen), in his late twenties, is a short, squat, dark-haired man hoping to talk to the spirit of his older brother. He carries a bottle opener on a keychain from his brother. He’s never been here before for that night but he remembers his older brother coming back refreshed, soothed. Cora (played by me), a sixteen-year-old girl of Native American ancestry, is here to check if her sister who has been missing for nearly a year is here among the dead. It’s the first time she’s ever been here to speak to the dead. The oldest part of the graveyard is near a derelict, abandoned church. When the town became prosperous and the dead too numerous, a new church was built in town and the graveyard expanded, swallowing the old church and rolling past. Migrating bats stop at the church spire, adding to the atmosphere. Shrieking kids and more solemn adults walk through the cemetery on that night, carrying candles and flashlights; the more traditionalists wear a black scarf. A hazy light briefly shines at the old church belfry, outlining the flitting bats. The ground is uneven in the older part of the graveyard, but a newer central walkway has been built in the more recent section; it’s built of red marble and carries sound—one can always hear steps from it. It leads from the entrance to a mausoleum in Neoclassical style in the newer part of the graveyard, which displays holograms of people buried here. The holograms are “old” now and flicker at random. In the dark, the seekers hear the faint sound of one of the electric vehicles used by the maintenance personnel, but there is none to be seen. Startled by the sound, Danny drops his headphones and can’t find them again in the darkness. Amy is momentarily fooled by a hologram of her grandma and starts talking to her, then realizes her mistake with annoyance. Her imprints will be truly interactive! Morgan remembers riding in the back of his brother’s car, music playing. Children walk past the four seekers, dressed exactly like them, then disappear in the darkness ahead. A bat, highlighted by the train’s headlight, flies into the locomotive’s open window. Stumbling in the night, Amy loses her fidget spinner and picks up a smooth stick to replace it. Morgan drops his brother’s lighter. Danny hides in the brush and is bitten by a spider. The seekers see dark silhouettes waking from the cemetery toward the train. Steam hisses from the train but no steps can be heard from the central walkway anymore. Danny notices the shabby clothes of those walking by, recognizes the face of a girl he used to know. Danny thinks the passengers getting on the train are those without hope. As he tries to get through to a man that looks like his father, the PA system comes on with a last call for boarding. Morgan loses his black scarf, which had belonged to his father. Amy is convinced that a perfectly natural but unexplained phenomenon takes place on that night that would make it easier to record an imprint. She will be back next year. Danny and Morgan give enough hope to their Beloved Dead to fade away after midnight rather than board the train of the hopeless. Maybe they can talk next year. Cora sees her sister among the dead and now has her answer. She will be able to mourn. No one gets a boon, but life goes on. Photo: Graveyard at dawn CC BY-NC-SA 2.0 Roy Schreffler. 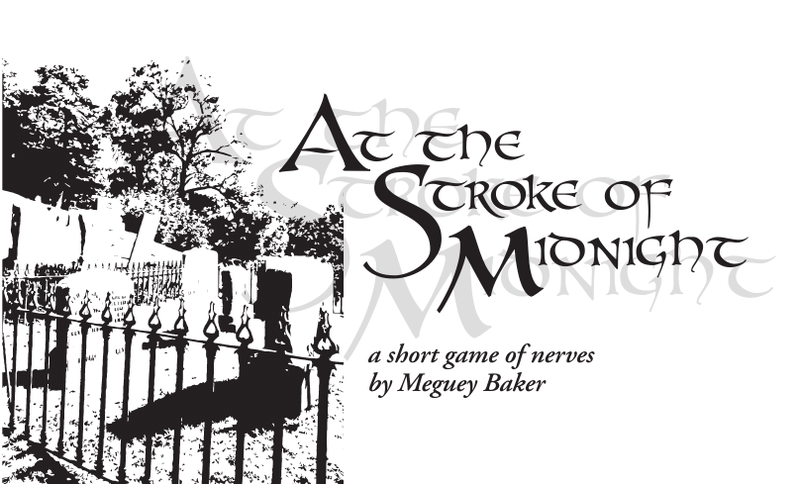 Posted on October 23, 2018 November 3, 2018 by mechanteanemonePosted in games, rpgsTagged actual play, At the Stroke of Midnight, BayArea, BigBadCon, conventions, games, Night Sky Games, rpgs, story games.